Whatever is in the water in Kerala these days, I've gotta get some for myself. India's newest hot spot for thrilling filmmakers is churning out new and exciting films all the time, and the latest thriller to hit cinema screens in Tinu Pappachan's Swathanthryam Ardharathriyil (Freedom at Midnight). Pappachan, making his first feature after working as an assistant on the films of Malayalam cinema's current critical champion Lijo Jose Pellissery, is a force to reckon with. The film feels like the work of a hungry contender looking to make his mark, and with a crackling script by Dileep Kurian to work from, it definitely succeeds in making an impression as an incredibly solid thriller punctuated with brilliant action and storytelling. Jacob (Antony Varghese) is on the run after he and his girl Betty (Aswathy Manoharan) and best friend are accused of murder. When the cops come to collect his girl from a convent in their town of Kottayam, Jacob intervenes and takes her on the run. The couple flee to the nearby state of Karnataka hoping to start a new life, however, their freedom is short lived as they are quickly separated by communal riots and Jacob is caught by the Kottayam cops and dragged back to his hometown to serve a sentence in the local sub-jail. Life without Betty seems unlivable for Jacob, and from here on out, the last two-thirds of the film are dedicated to freedom from prison by any means necessary. On his first day in jail, Jacob witnesses a riot that sees one of the jail's most notorious prisoners leading a gang of hoodlums to plow through the prison guards in an attempt to escape. Not one to lose an opportunity, Jacob thwarts the escape, though not before trying to capture his own freedom, making himself an enemy that will follow him throughout the film. Soon, Jacob reluctantly acclimates to prison life as he awaits his transfer to the main jail in the smaller sub-jail in Kottayam. While he is there he meets up with Simon (Vinayakan), a shrewd leader among the prisoners and the pair begin to hatch a scheme to escape. Bit by bit they put together a team of like-minded and trustworthy accomplices whose plan to escape borrows more than a little bit from The Shawshank Redemption, but more in the form of homage than outright rip-off. The rest of the film follows their trials and tribulations on the way to the fateful evening. Plans are made, steps are taken, little by little their plan comes together. They are soon joined by Devassy (Chemban Vinod Jose, writer of Angamaly Diaries) and the team gets even stronger, which is part of the reason the film isn't a total success. It's never really in doubt whether or not Jacob will escape, the only hangups are who will make it out with them and what kind of hoops they will have to jump through. However, predictability is a small price ot pay for a film so stylishly executed. The cinematography by Gireesh Gangadharan is very solid, his framing, staging, and lighting are all incredible to watch and make this film as much a visceral experience as an intellectual one. Action choreography and stunts by Supreme Sundar are all fantastic and only occasionally spin off into the kind of physics defying silliness we often see in Indian action films. However, the staging is awesome. The team puts their soggy surroundings to excellent use and there's nothing quite like well-executed action in the rain. As much as the film is a thriller and an action film, it's anchored by genuinely good performances from its cast, and this is why I can forgive its occasional missteps. Varghese takes the lead in only his second acting role after Angamaly Diaries and proves that he's a talent on the rise. Kerala is one of the few regional film industries that hasn't yet taken the Bollywood bait of insisting their film heroes maintain washboard abs at all times. In Kerala, Dadbod rules, this has the effect of making its leading men all the more relatable. Varghese is capably assisted in the film by his co-conspirators, each of whom have a solid career both ahead of them and behind. Vinayakan is one of my favorite Indian character actors after a scorching performance in Rajeev Ravi's Kammatipaadam, and his acting here and in the upcoming Ee Ma Yau are further proof that he's the real deal. Chemban Vinod Jose also acquits himself well here and in Ee Ma Yau. The rest of the cast is also quite solid if largely anonymous behind this trio of powerhouse performers. If Swathanthryam Ardharathriyil has any major flaws they don't truly show up until the film's final reel. At a touch under two and a half hours, it's a bit long, with the set up taking more time than it probably needs to. However, once the wheels are in motion for the climactic action, the film seems to lose all sense of pacing and careens toward the end at lightning speed. The finish feels rushed, as though they realized they needed to end it and just cut a lot of material out. I'm not saying the film needs to have been longer, but it feels like the fat could've been cut in other places, leaving a bit of time for development before the credits rolled. A small issue for me, but one that struck me as the lights went up in my cinema. 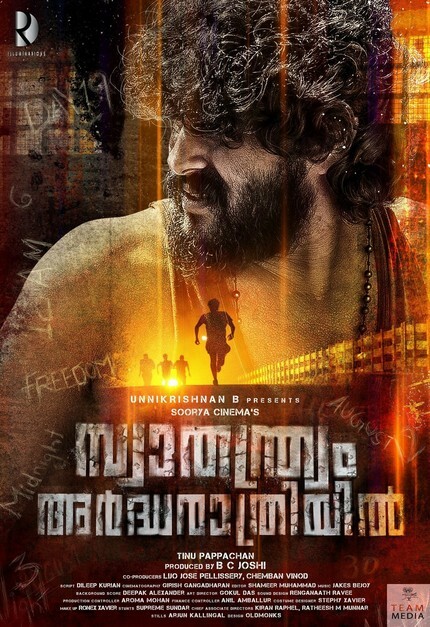 Swathanthryam Ardharathriyil is another in a recent burst of incredibly solid Malayalam language features hitting cinemas around the world and it's clear that these films are only going to get better and better. So much energy is expended in writing about India's mainstream Hindi-language films that these regional industries often go completely unnoticed, but this is where the real work is being done. Tinu Pappachan is another young filmmaker ready to make an impression, and his first film is a corker.